Investigate the circumstances of your brother's expulsion from the magical school. The story is set in the 1980s, seven years before The Boy Who Lived enrolled at the school. Players will be treated to appearances from not only their favorite teachers and faculty from the story but also many of the main cast's elder siblings, like Ron Weasley's older brother, George. "You'll see characters like Professor Dumbledore, Professor Snape, Hagrid, and many more, who'll appear and interact with the player character, during the game," Matt London, a senior narrative designer at Jam City, told Engadget during a recent demo. "In addition, there are a bunch of new characters as well, that we're introducing." The gameplay is easy enough that small children can play along. Navigating and interacting with the surrounding environments, whether that's at Hogwarts proper or down in Diagon Alley, involves little more than taps and swipes of the screen. For example, when learning the Lumos charm from Professor Flitwick, players must trace the wand's path to complete the spell -- in this case, the shape of a caret. Or, when collecting materials for Snape's potions class, players simple tap on the scene's highlighted items. It's simple, mindless entertainment -- about what you'd expect from a casual free-to-play game. The game often felt like a stripped-down version of Bully's gameplay mechanics with the level of difficulty you'd find in The Simpsons: Tapped Out. It's certainly not my cup of tea, but if you're looking for a few minutes of distraction waiting for your bus by delving into the Harry Potter universe, this game serves as an effective time sink. 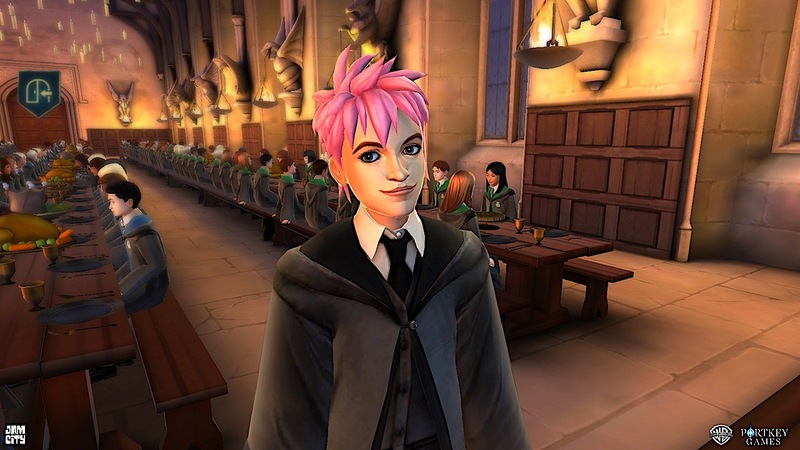 Beyond simplistic controls and gameplay, Hogwarts Mystery offers a robust avatar creation and customization scheme. "It was super important to us, that all Harry Potter fans feel like they can create a character that looks like them, and know that they belong in Hogwarts," London explained. "So everything from lip shape, to eyebrow shape, nose shape, all these things are adjustable." Players can also customize their character's clothes and hairstyle using the game's currency (which can be purchased for real-world money or slowly accumulated by completing various in-game tasks). The game's major selling point is the sheer scope and depth of its story. The Jam City team spent two years crafting the Hogwarts Mystery script, pouring in countless details, callbacks, and subtle nods from the entire book and film series, including Fantastic Beasts and Where to Find Them. This is an extremely ambitious effort, especially for mobile. There have been at least a dozen other Harry Potter video games released since 2001 and virtually all of them focus on either a single school year or a specific book (like Harry Potter And The Half-Blood Prince from EA) for their subject matter. Heck, even the LEGO Harry Potter game only covered four school years worth of content at a time. To pack the entire bibliography into a single game, and recreate it so faithfully, is a testament to the Jam City team's efforts over the past couple of years. "This script that we're working on, is fast approaching 200,000 words, and growing, which is longer than the novels," London said. "It's not a game that you're going to want to sit down and play for 12 hours straight. That's not the way it's designed. We want players to feel like they have Hogwarts in their pocket all the time, and so, it's a game that I hope players will play for months, if not for years." Even if you wanted to play of 12 hours straight, you simply can't. The game utilizes a standard free-to-play trope wherein every action the player takes requires a set amount of "energy" which slowly regenerates over time. Once you've used up your current allotment, you'll have to sit tight and wait for it to regrow before continuing. From the hour-long demo that I watched, this game isn't going to be challenging anybody's dexterity or problem solving skills. There are small secrets and easter eggs tucked into the levels, to be sure. But for the most part, the game revolves around completing various tasks within an allotted amount of time, usually between one and eight hours. And even that is designed to be as low stress as possible. Overall, Hogwarts Mystery is equal parts Choose Your Own Adventure, wherein the choices you make have a lasting impact how the story progresses, and Ready Player One, wherein the storytellers attempt to force as much nostalgia down your gullet as humanly possible. So if you're looking for challenging fast-paced gameplay, look elsewhere. But if you want to live your best Hogwarts life in a richly-detailed universe faithfully crafted from the Harry Potter universe as JK Rowling herself would have imagined it, then Hogwarts Mystery is well worth a download.